Rollators and walkers are designed to assist in mobility and stability for disabled persons, seniors, and recovering patients. Health care specialists recommend rollators to patients with physical disabilities so as to make them move freely and build their confidence. The stability provided by rollators prevents patients from falling over and breaking their hips. 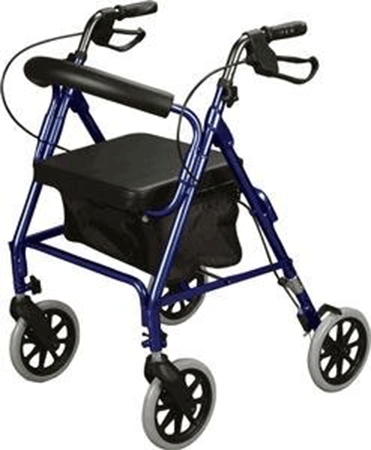 Walkers are designed for people with lesser body strength are generally a slower mode of moving around. The patient will pick up the walker and step forward as it provides support. Rollators, on the other hand, are walkers with wheels and come with a 3 or 4 wheel design. To prevent the patient from rolling away, rollators are fitted with brakes. There are various factors to one should consider when buying a rollator or a walker. The patient’s weight, stability, height, mobility needs and physician needs will dictate a lot on which rollator you choose. If the person loves to move around a rollator will be more suited. It is important that you look for a light and sturdy rollator as the person using it won’t be easily fatigued. Medline Premium Empower Folding Rollator Walker with 8″ Wheels. The Vibe wide rolling walker is ideal for people who move around a lot. It has a four-wheel design and is fitted with an easy use locking break. Its small design gives it an added advantage for indoor use. The walker has a higher weight capacity of 400 pounds and made of lightweight stainless steel. It can be easily folded into a smaller unit in case you want to travel. 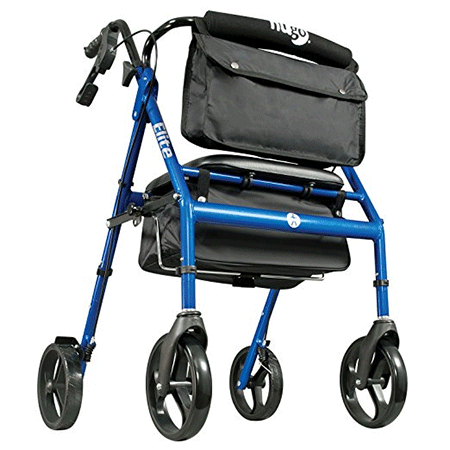 The walker is fitted with an extra wide padded seat and a pouch under it. People with a height range of 5’5” to 6’1” can use this comfortably without straining their backs. The walkers weigh only 18.5 pounds. The wide seat might use up more storage space. Design by Porsche design studio, the Alevo represents a new age walkers. The German rollator company aimed at creating an ultralight walker made from carbon and fiberglass. The carbon frame gives it aesthetic and unique look and it only weighs 12.5 pounds. Integrated reflectors on its sides increase the visibility of the walker and it has been approved for street use. An adjustable push bar makes this walker ideal for people of different height settings. You can easily customize the walker to best suit the posture of your loved one thus helping them become more independent. The walker has a removable bag and a soft padded seat. Ergonomically designed handles and a back strap that offers back support. The Drive Medical Arc uses an innovative “roman” arch design to offer better stability and support. To save on space its designers used and X style folding mechanism, carrying around this walker around in your car won’t trouble you. A center folding collapsible seat is fitted to help the patient relax when fatigued. Its seat and pouch are made from a waterproof durable material and the walker is ideal for both outdoor and indoor movement. Handlebars are made using form-fitted rubber hand-grips for easy maneuverability. The arc lite provides superior support and stability and is suited for any height setting. It weighs in only at 15 pounds and you will love its attractive design. Arc-lite design providing extra support and stability. 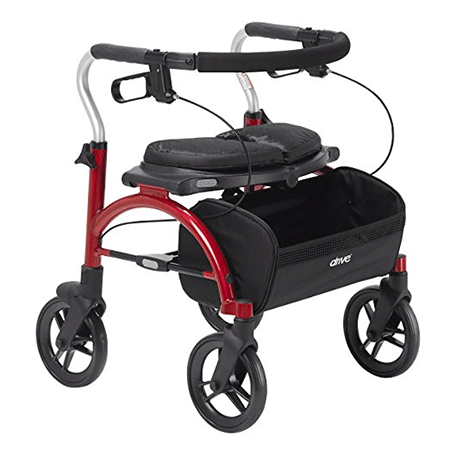 Rollator rolling walker features a curved padded backrest and a flip up pouch under the seat. It is fitted with loop-lock brakes to protect its user from toppling over. Rollator rolling walker can be easily folded into a compact size for easy transportation. The cushioned height handlebar uses a 1-inch increment setting. The overall width of the rollator is 24” and it weighs only 16 pounds. Its medium sized seat is ideal for everyone and is fitted with ergonomic handlebars for a better grip. It has a weight capacity of 300 pounds. Built using a lightweight aluminum frame, the Medline posh rollator claims to be 40% lighter than all of its competition. The reinforced aluminum frame makes it safe and easy to maneuver. If you are a looking for a stylish rollator then this is your best bet. It is fitted with water resistant zebra print pouch and storage bag. 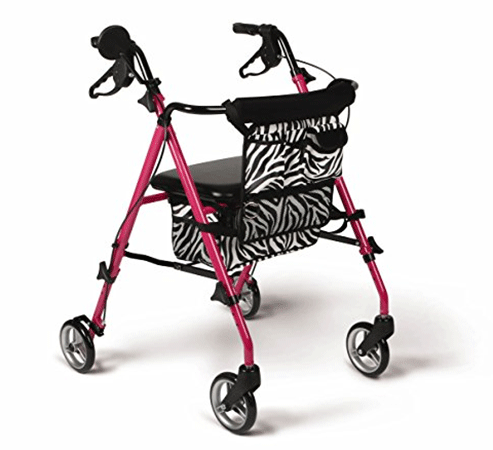 The Medline posh rollator is colored pink and is fitted with a cosmetic mirror. The distance between the hand grips is 17” and has a seat height of 18-23”. 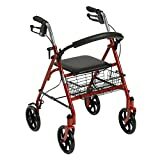 Medline rollator has a weight capacity of 250lbs and is one durable walker. 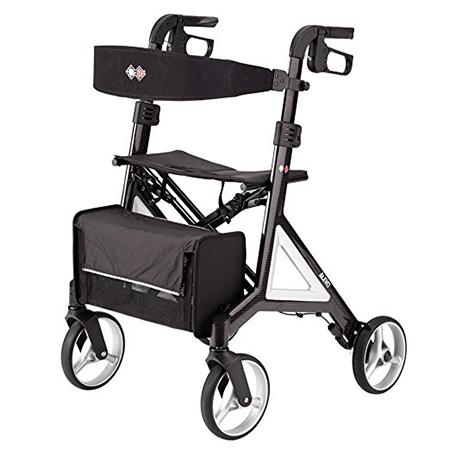 The Medline premium folding rollator features an extra-wide memory foam and flip-back rest for extra comfort. It is designed to act as a comfortable resting option in case you are tired of walking. The convenient loop style brakes can be pushed to lock the rollator from moving. It is fitted with a cup holder, removable storage tote, tray organizer and reflective safety tape. This rollator is easily adjustable and the adjustment points are perfectly marked. The extra-thick, memory foam helps soothe the back of tired users. 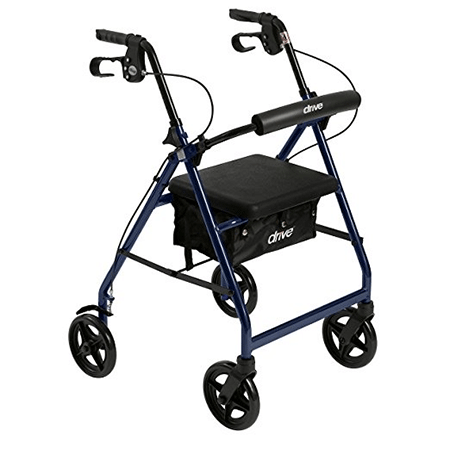 It is fitted with large 8” wheels for easy support and maneuverability. The Medline premium has a weight capacity of 300 lbs and folds completely flat for easy transport. 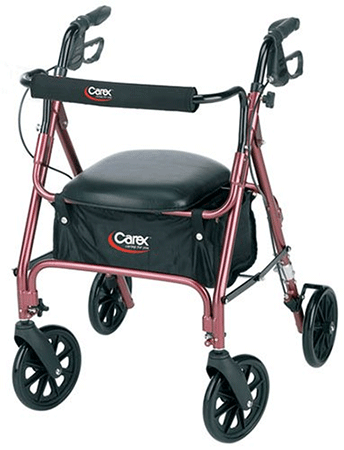 The Carex rolling walker has perfectly blended comfort, stability and convenience with this walker. Its oversized 8-inch wheels makes it easy to use in the outdoors. A padded seat and backrest offer convenient seating area whenever you needed. The backrest is protected using a washable nylon seat cover. It has a convenient storage space under the seat which can be used to safely store your items. The storage space is quite roomy and can accommodate most of your items. The handle bars are easily adjustable to your desired height and is fitted with ergonomic handle grips. The carex boasts of top of the line braking system and guarantees the best safety measures. It weighs only 17.5 pounds and has a weight capacity of 250 pounds. 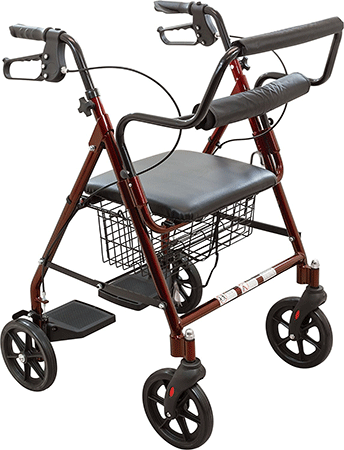 The roscoe medical rollator plays a combined role of a rollator and a transport chair. Patients can be transported in the rollator and is fitted with footrests for extra comfort. Large 8-inch wheels are fitted with easy lock and loop style braking system. The curved backrest can be used as a push handle for easy patient maneuverability. Its padded seat is fitted with an easy folding mechanism for easy storage. Underneath the seat, there is a handy wire basket for storage and it weighs 25.8 pounds. The Nova medical is regarded as Nova’s signature rolling product. It was designed for optimum stability and style and is fitted with 8” rugged wheels. The 8” rugged wheels are perfectly suited for the outdoors. Its seat comes with for height setting designed to accommodate people of all heights. If you are too tall you can adjust the seat to suit your height. A convenient flip-up backrest makes it easy to rest. The nova can be easily folded for easy transport and storage. It is also fitted with an easy to lock handbrake for maximum control. 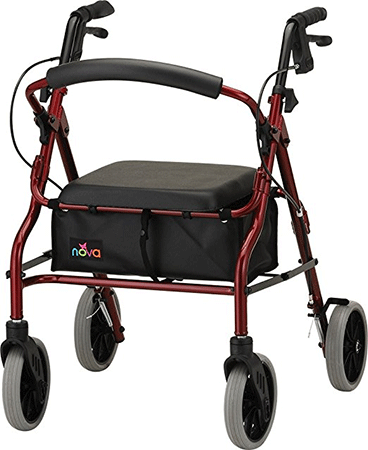 Overall the Nova rolling walker is designed for people within 5’2” to 5’8”. It has a beautiful metallic finish and weighs only 16 pounds. 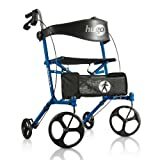 The Hugo portable rollator is designed to support an adult of 300 pounds. It features a built-in seat with a backrest providing a perfect seat. The handle bars are easily adjustable to suit any height and are fitted ergonomic hand grips. It is fitted with 8-inch wheels making it the perfect companion for outdoor movement. Hugo portable provides great stability and support and increases the user’s security. The Hugo Elite is easy to assemble and is fitted with an adjustable seat. Under the seat, there is a storage area and additional saddle bag for extra luggage. The backseat has an extra hidden storage compartment. The built-in seat offers a perfect place to sit and relax when you feel fatigued. Hugo elite rollator is fitted with adjustable handle bars for better posture and grip. The distance between the handlebars is 17.5 inches and this rollator has a weight capacity of 300 pounds. Fitted with a new padded seat design to offer maximum comfort. Under the seat, there is a zippered pouch that keeps your stuff safely hidden from prying eyes. 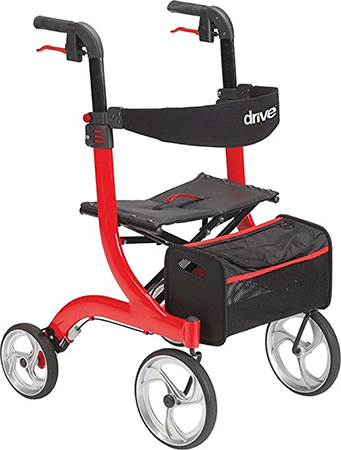 The Drive medical is fitted with a hinged and padded backrest. It is fitted with loop lock deluxe brakes designed to protect its occupant from rolling away. The 7.5-inch caster wheels make it ideal for outdoor movement and it holds up firmly. The drive medical is ultra light and weigh only 17.2 pounds. 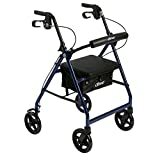 The Drive medical four wheel rollator is a best seller on Amazon thanks to its numerous features. It is fitted with a durable padded seat and backrest which can be easily folded. A sturdy steel frame basket that is ideal for storing personal effects. Its users can adjust the seat height using a height lever for better seating adjustment. Its 7.5-inch non-marring caster wheels are perfect for both the indoors and outdoors. 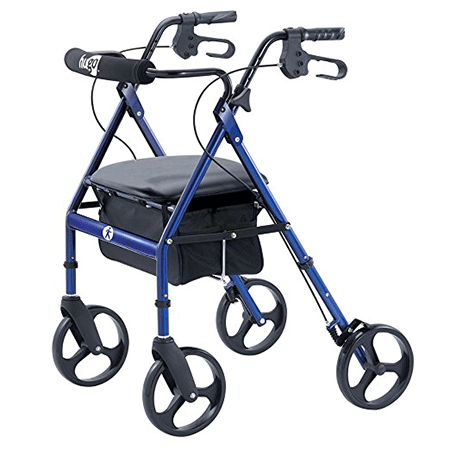 Easy to use loop locks keeps this rollator completely stable and is built using a strong steel frame. It weighs only 18.6 pounds and has a weight capacity of 300 pounds. When selecting a rollator or walker one has to pay close attention to the their mobility requirements. If you move around a lot, you need a rollator with bigger wheels and an extra padded seat. More movement contributes to fatigue and it is advisable that you have a comfortable place to seat and rejuvenate your strength. Also, pay attention to the durability of the rollator to avoid incurring extra costs when replacing it.